• To keep our prices as low as possible, we often ship directly from our distributor, which means expedited delivery to you. We use UPS, U.S. Postal Service Priority Mail services. 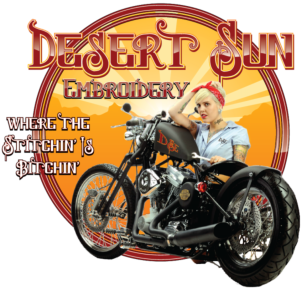 • Desert Sun Embroidery, LLC is not responsible for any delay caused by the shipper in the delivery or shipment of goods, or for any damaged goods incurred by reason of such delay. All damaged goods shipments should file a claim against the shipper. We will do our best to assist you in filing a claim for damage goods. • All orders from Alaska and Hawaii are shipped via US Mail and may take an extra few days for delivery, unless 2nd Day or Next Day delivery shipping is chosen when checking out. An additional $25.00 per shipment is added to all Alaska and Hawaii orders. • All orders taken from Military address, APO, FPO addresses, will require an additional $25.00 in shipping and handling charges. • We only ship to Continental United States, Hawaii and Alaska. We do not ship to International at this time.